Cami Mattson is the President and CEO of San Diego North Convention & Visitors Bureau. 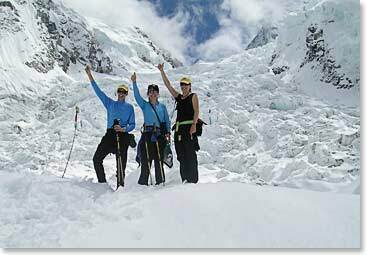 Cami, you have climbed Kilimanjaro and trekked to Everest Base Camp with Berg Adventures, tell us how the trips compare? I learned about the Everest Base Camp trek while I was on Berg Adventure’s web site planning for Kilimanjaro. I decided that if I liked Kilimanjaro, I would plan for EBC. Well, I loved trekking up Kilimanjaro. The heartfelt satisfaction came from a variety of factors. It was a physical challenge rewarded by accomplishment. It was the sincerity and care of our African porters helping us in a most gracious and humble way. It was the extras Berg Adventures put into our journey including special meals, sleeping locations, top-notch gear, and safety precautions. I found the same rewards and attributes on the EBC trek. Kilimanjaro was slightly more challenging than EBC because we ascended at a more aggressive rate and we stayed in tents versus Sherpa lodges. Kilimanjaro was shorter as well (7 days), but when paired with an African safari, the length of both trips was comparable. Each trek was scenically and culturally rich and both were consistent with Berg Adventures quality and service. Whether I was with an African Guide or Nepalese Sherpa, I knew that I was going to be well cared for. After my experience on Kilimanjaro, I knew that we would be moderately paced to allow for proper acclimatization in Nepal. I also knew that we would have the maximum comfort and safety possible while facing the elements of our rugged outdoor environment. Did I mention the food? I don’t know how we had such extraordinary meals on both trips with the outdoor and high-altitude limitations. Let’s just say we weren’t going to starve. I had never trekked at high altitude before Kilimanjaro. I knew it would test my physical ability, but that is what I found exciting and frightening about it at the same time. I was definitely anxious to find a company I trusted. I heard about Berg Adventures through a referral and after several conversations with BAI staff, I felt confident using the company. After my two treks, I would travel anywhere in the world with Berg Adventures. I can’t imagine being with any other company when it comes to my personal safety and the risks associated with mountain climbing and trekking. To others I’d say you won’t find a better company and people who treat the environment and locals with optimum respect. You won’t find a better company that consistently delivers a first-rate experience. What was your favorite moment during your trek to Everest Base Camp? Do I have to have a singular moment? EVERYTHING! I remember waking up in the village of Pheriche after 5 days of drizzle and rain. The sky was perfectly clear and the majestic peaks of the Himalayas surrounded us. It was like a curtain had lifted unveiling these spectacular snow-capped peaks. It took my breath away. You have a special relationship with a primary school in Tanzania can you tell us about that? After trekking up Kilimanjaro, I formed a unique bond with the wife of my chief African guide. Her name is Angel, an appropriate and fitting name to match her giving spirit. In sharing emails, she told me about her volunteer work with a school of 75 orphans in Arusha Tanzania. I was impressed with what she was trying to do with so little. I’ve been blessed with so much that I wanted to help. I coordinated an exchange with my cousin’s kindergarten class in Boulder Colorado. The Colorado children learned about Africa and raised money for the orphans by selling goat’s milk soap they made in class. The initial contributions allowed the orphans to have a hot meal during school, uniforms to support personal dignity, and transportation to school for those too far to walk. I’ve worked to generate additional funds for the children by having friends sponsor my trek to Everest Base Camp in a promotion called “Climb for a Dime.” It is my vision to have sustainable long-term funding for this African school. It is also my vision to teach more children in America to embrace cultures around the world and develop compassion and a giving heart for those less fortunate. Do you have any plans for future adventure travel?